It was not too long ago that airlines lacked online booking capabilities. Think about it: the shift was one that drastically altered the entire user experience in what some might consider to be a rather quick and easy way. On the front end, that is what it was — an addition to a long list of website functionality that simply made the booking process more accessible and digitally familiar. On the back end, however, that transformation was anything but facile. Legacy airline planning, along with the employee and consumer interactions that it affects (i.e., practically all of them), has ingrained certain procedures so far into the core of the industry that affecting change can truly feel impossible. We, of course, know that is not true and the online booking example has proven it. The integration of intelligence as a technology into core, organizational structures can dramatically improve the health and stability of a manufacturer, lessor, creditor, or airline when user needs and experience design are taken into consideration. Luckily enough, the application of machine intelligence continues to quantify even the most intangible of goals — think customer satisfaction — long enough for drastic innovation to present a solid return on investment to those calling the shots. Machines have been adopted and adapted for internal benefits for many years, making operations relatively hassle-free in comparison to previous decades, but experiences have not improved that much for travelers. With alternative options for their customers popping up left and right, airlines are the ones seen itching to spearhead the intelligence transformation. At the end of the day, their brands are customer-facing and on the front lines. They have the user data necessary to communicate current needs and predictable desires back to other members of the industry, thereby propelling airline planning as a whole into the future. The first step is identifying the problem. For example, network planners and their organizations (e.g., manufacturers, lessors, and airlines) must come to the collective realization that trying to make decisions 45 days before any flight is not only premature, but also bad for business. With marketplace fluctuations, weather anomalies, workforce inconsistencies, and maintenance surprises, establishing the terms for a flight too far in advance is counterintuitive and not in line with the aerospace business of the future. When compared with the agility offered by a data system well-versed in and better connected to the industry’s happenings in real time, manually establishing flight details sticks out like a retrofitted thumb. Indeed, technology is largely about revisiting the reasons for which things are done the way they are. A system of artificial benefits (reached by way of reductionism) is not the solution — key industry players must focus on progress in a way that is useful. Otherwise, legacy baggage will continue to hamper the acceleration brought on by the application of artificial intelligence (AI). Today’s network planning sets the stage for information technologists to reconsider their current dependence on Microsoft Excel, identify the alternative tools that they need, and build those in a contemporary way. If everyone is too busy patching an already-flawed system, then it becomes increasingly difficult to do something exponentially different. Machine intelligence offers a different approach: it tackles multiple problems simultaneously by rethinking their foundational source and reimagining the structure of that core to be more agile in the face of its own evolution. The combinatory effects of manufacturers, lessors, and airlines contemporizing certain aspects of their businesses are enabled by the AI opportunity. The data exists and the computational technology is accessible, but the conversation is what needs to be had in order to avoid dulling the benefits of future developments. Across the organizations of all three players, there is something to be said about exploring the long-term benefits of machine intelligence and watching them outweigh any short-term inconveniences. The potential incremental value of AI over other analytical techniques in the travel category, for example, is said to have reached 128 percent. Meanwhile, that same metric stands at 30 percent for the aerospace and defense industry. Rather than tacking on new solutions for each individual issue that arises — much like the dreaded technology stack that many businesses find themselves battling — a horizontal approach, empowered by AI, can be established across each organization and, subsequently, the industry as a whole. 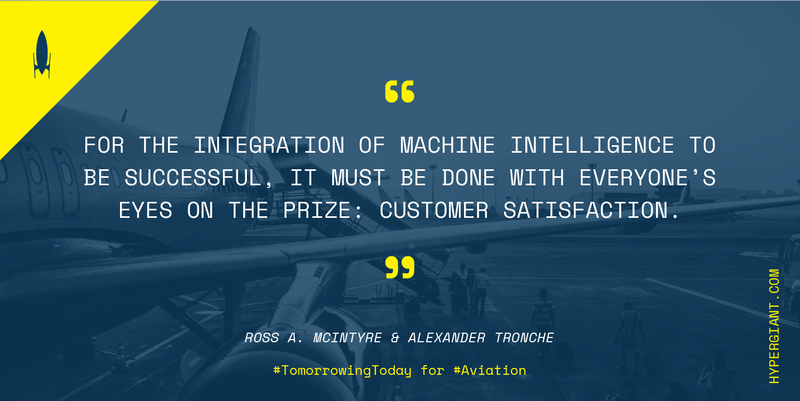 If all participatory groups incorporate data engineering and AI into their business models, the positive effects are felt across the aerospace industry for both those working in it and those depending on it. For those working in the aerospace industry, the viability of one’s current product portfolio and its continuous improvement is a direct reflection of the organization’s longevity and survival. But when usage is much higher than anticipated and data grows at an unforeseen rate, it becomes evident rather quickly that physical workforces are limited in their ability to analyze, maintain, and predict. Were employees capable of manually handling the amount of information available today, the sheer amount of minds required to comprehend it would make for strict processes rather than the malleable workflows resulting from custom, AI-enabled platforms. Human efficiencies are amplified by the near-infinite capacity that an intelligent machine offers. Upon establishing its knowledge base and training it in the language (both verbal and visual) expected by its users, a strong piece of machine intelligence can effectively bridge the gap between large amounts of untapped data and an organization’s top-level decision-makers. In aerospace, this is where AI-enabled predictive maintenance and data mining come in. Both are introduced in situations where data and business value are analogous — where the ability to act quickly across one’s product portfolio can mean the difference between making it and breaking it. 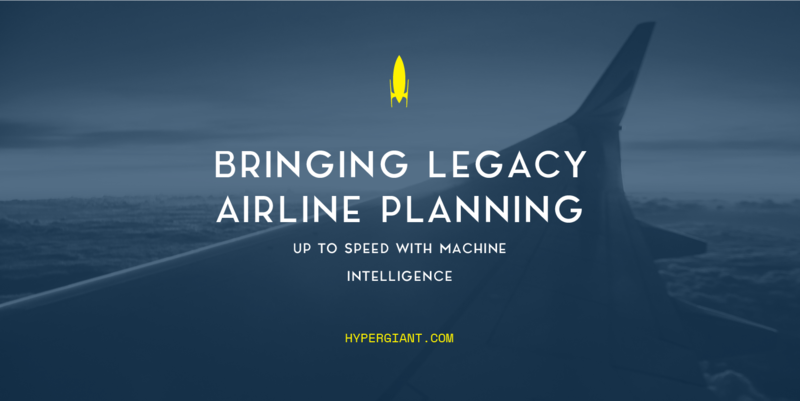 Download and read our guide, entitled Bringing Legacy Airline Planning Up to Speed with Machine Intelligence, to further understand the implementation of these AI-enabled techniques and how they ultimately better the customer experience. Any questions? Our authors can always be reached via the emails included in the PDF.